Everything you need to know about this vital tool. You never know when you’ll need a Windows recovery drive in order to restore your system to a pristine state, so the time to make one is now—and it’s very easy to do. 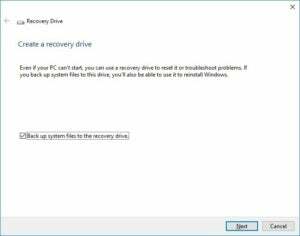 A recovery drive is similar to the media you’d receive if you bought a prebuilt system. Back in the day, PCs would ship with a CD or DVD that included an image of the system as it left the factory. If your PC’s OS went sideways, you could easily restore it to the way things were on day one (though you’d lose all of your subsequently created data and applications, obviously). Nowadays manufacturers usually just put an image of the system as it left the factory on a hidden partition of your main drive. A Windows recovery disk builds on this idea. In addition to letting you reinstall Windows, it includes several troubleshooting tools, which can be lifesavers if your system won’t boot. You can easily create a recovery drive using Windows 10’s built-in tool. Here’s how you create one and what it can do for you. First, obtain an 8GB to 16GB USB drive and insert it into an open USB port on your PC. Next, go into Windows’ Control panel (right-clicking the Windows icon is the easiest way) and type create a recovery drive into the search bar. The manual method would be to go to System & Security > Security & Maintenance > Recovery. You may need to enter your admin password to go further. In the resulting dialog box, check the box labeled Back up system files to the recovery drive. With your recovery drive created, you’ll have to boot from it in order to use it. How your PC boots from USB varies according to your PC’s age and motherboard, but typically you can press one of the F-keys during boot to arrive at a boot selection window. From there you select the USB drive you’re using, and it should proceed to boot from the recovery drive. When you successfully boot from it you’ll see a screen that offers a Troubleshoot option. Click on that and you will see the following: Recover from a drive, and Advanced options (and possibly Factory Image Restore, if available). What you’ll see when you boot from the recovery drive, allowing you to either fix Windows or reinstall it completely. The first option lets you reinstall Windows. Note that it says you will lose all your data and installed applications. This is a clean installation of Windows, not a restore from backup or something along those lines. This is the nuclear option, in other words. The advanced options offer quite a few useful troubleshooting and PC repair tools. System Restore: Use this to revert your PC to a happier time, when things were working normally. This does not affect your data, but it does affect installed programs as it replaces the registry with an earlier version. As you can see, it’s quite useful to have one of these recovery drives handy. Do yourself a favor and make one now. And if for some reason you can’t create a recovery disk in Windows 10, we have some suggestions on that front as well.